Southern Girls Rock Camp 2018 ..
Five MTSU professors have been honored for their excellence in helping students learn by doing. • Dr. Michelle Boyer-Pennington, professor of psychology. • Dr. Robert “Bob” Gordon, assistant professor of media arts. • Dr. Lucy Matthews, assistant professor of marketing. • Dr. Hanna Park, assistant professor, public relations. • Dr. Ben Stickle, assistant professor, criminal justice administration. With more than 600 course selections, the Experiential Learning Scholars, or EXL, Program at MTSU is designed to enhance student learning through practical experiences in their fields of study beyond the traditional classroom setting and directly engage the students in service learning projects. Program officials note that more than 47,000 MTSU students have participated in EXL community projects, contributing more than 2.5 million hours on community activities, since 2007. The program offered its first classes in fall 2006. Boyer-Pennington requires each student in her general psychology class to identify a group to which he or she shows “implicit bias” and do a service project involving that group to learn more about it. “EXL courses encourage students to think differently, to be more open to ways of thinking that are different than their own, and to identify issues they care about,” Boyer-Pennington said. “Thanks to professor Gordon and his experience-based courses, I feel very prepared and confident in my abilities for starting my career after graduation,” said Laura Morgan, a senior majoring in media arts and minoring in entertainment technology. “In Dale Carnegie courses, students not only learn human relations principles but they are required to live out those principles and report to the class on the application,” Matthews said. Class projects in Park’s public relations courses include oral presentations, research reports, campaign books and peer evaluation. “Dr. Park has done a tremendously fine job with the EXL courses that she is teaching, not only benefitting the students in honing their knowledge and skills, but also helping 24 different community and campus organizations, as well as local businesses,” said Dr. Zeny Sarabia-Panol, associate dean of the College of Media and Entertainment. In one of Stickle’s criminal justice administration courses, students are required to search for and analyze crime statistics, conduct a home security check and visit a local retail store to identify objects that could be stolen easily. “Based on my experiences with professor Stickle and the materials and. activities he’s designed, I believe his work exemplifies the excellence of student learning experiences sought by the EXL program,” said Daniel Pfeifer, a professor of recording industry and an architect of the EXL program. 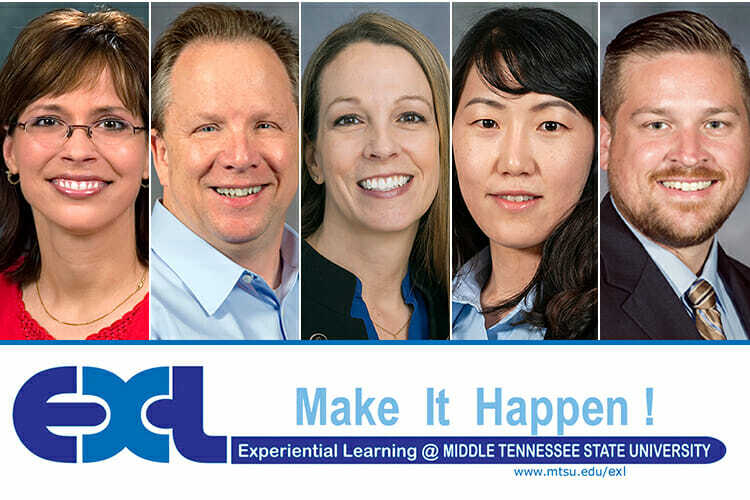 To learn more about MTSU’s Experiential Learning Scholars Program, go to www.mtsu.edu/exl or call the EXL office at 615-898-5542.